Overeating or eating when one has no inclination for food; injury to or diseases of brain, uterus or testicles, early stage of pregnancy; diseases of liver; worms; fainting fit; hemicrania; excessive rotations; journey by boat. Ipecac. 3—Constant nausea owing to trouble in the alimentary canal; salivation; a sense of emptiness of stomach; greenish or blackish or mucus vomit. Robinia 3,6—Nausea; acid or watery vomit. Ars. 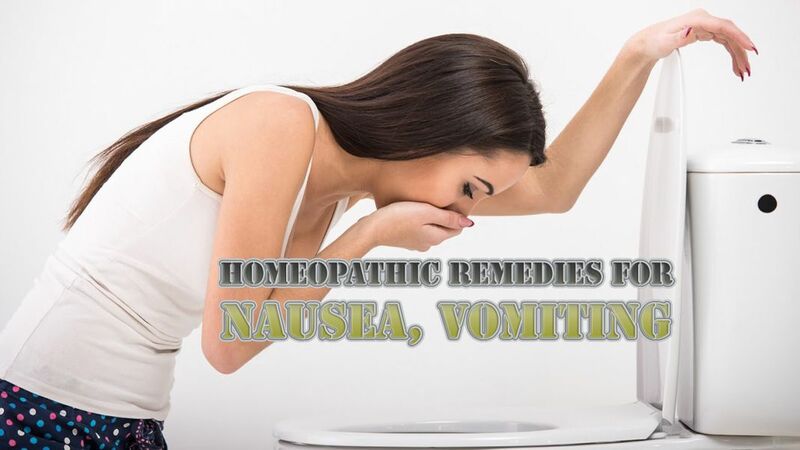 3x, 12, 30—Vomiting due to ulcerations in the stomach; sense of heat or burning in the stomach and abdomen; acid vomit after meals; occasional nausea with prostration. Antim Crude 6—Weight in the stomach; tongue coated white; loss of appetite; nausea. Apomorphia 3—Sudden vomiting without previous nausea; vomit of drunkards or opium-eaters. Iris Vers. 6—Vomiting of food or bile; headache and belching. Kreosote 6—Vomit due to phthisis, diseases of liver or kidney; pregnancy or morning sickness. Arnica 3—Due to brain injury. Cocculus 6, Petroleum 6, Kali phos. 12x (trit. ), Natrum Phos. 12x (trit. )—Due to boarding steamer or boat or riding in carriages. Ipecac. 3x, Cocculus 6, Millefolium 1x, Hamamelis 1, Kreosote 6—Blood-vomit, Iris Vers. 3, Podo. 6, Bryo. 6, Merc. Sol. 6—Bilious vomit, Nausea stops after vomiting— Antim Tart. 6. It is the best to secure rest to the stomach under all circumstances. Sipping very hot water or lump of ice checks vomiting. When diet is not at all tolerated, a very thin barley-gruel with a little salt and sugar or coconut water, latter is the best, is recommended as the first diet. When these are tolerated, thin milk-whey or curd, whey or soup or tea may be allowed. Thereafter fried or puffed rice (khai or cheera) rendered pultaceous by soaking in water and strained through muslin, may be allowed with sugar or salt to taste.